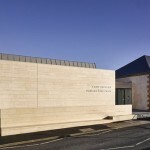 The Luan Gallery in Athlone, Co Westmeath has won a coveted Civic Trust Award in the 2014 awards programme. Now in its 54th year, the Civic Trust Awards is one of the most prestigious on the circuit and the Luan Gallery’s triumph was announced at awards ceremony in Blackpool on Friday 7th March. 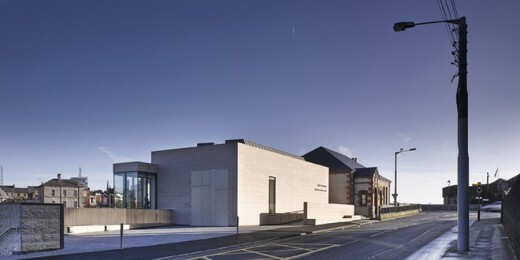 Commissioned by Athlone Town Council and Westmeath County Council, the Luan Gallery, which also won the RIAI Best Cultural Building Award 2013, was designed by Keith Williams Architects and is the first purpose built venue for the display of contemporary art in the Midlands. The building which sits on a spectacular site overlooking the Shannon close by Athlone’s Castle, the Shannon Bridge and the church of St Peter and St Paul, is centred around a remodelled historic Father Mathew Hall, a former Temperance building. 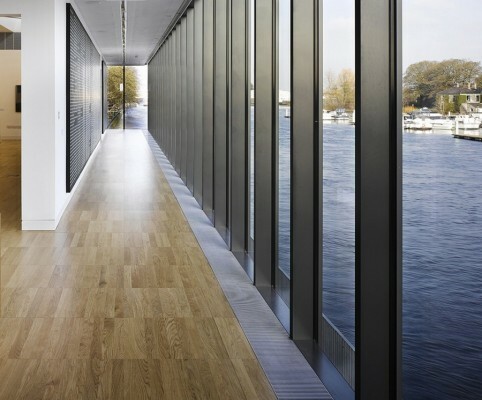 The project involved the adaptation of the 1897 Father Matthew Hall into a new gallery, the addition of new build wing to provide temporary white box gallery spaces, and a river gallery overlooking the Shannon. This project has radicallyaltered the existing building with the low grade extensions which had been added over time having been swept away leaving the core building intact. 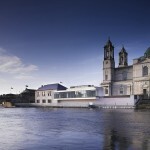 The existing elevations have been modified by the introduction of new large glazed panels opening up the building to the river and the Shannon Bridge. The new build wing has provided contemporary gallery space with black out capabilities to enable multi-use gallery, lecture theatre/ cinema for film exhibitions, meeting space for literature, music, drama workshops, and digital art exhibitions. 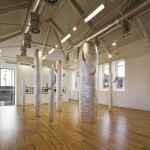 The two galleries are linked by a glazed entrance from the main road, and by a linear river gallery facing the Shannon. The palette of materials for the new gallery wing is limited to limestone and zinc. The Luan is Keith Williams’ third project in Athlone, the firm having earlier completed the Civic Offices & Library 2001-2005, and the Army Memorial 2008 – 2009. Construction has begun on Keith Williams Architects’ project for a new Art Gallery situated on the banks of the River Shannon in Athlone, Co. Westmeath, Ireland. 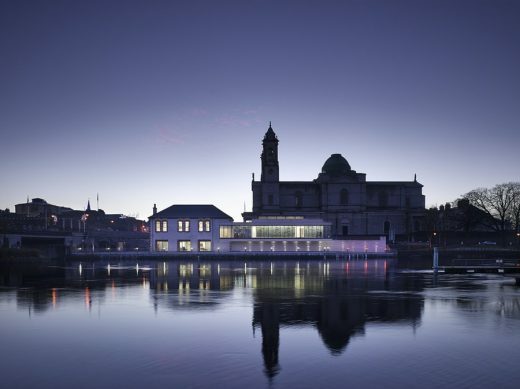 The project, for client Athlone Town Council, is situated on a spectacular site on the banks of the River Shannon, adjacent Athlone Bridge, and the neo-Baroque Church of St Peter and St Paul (1932-1939). The scheme involves the remodelling of an existing onetime temperance movement building, the Father Matthew Hall (1897) as a new artspace with the addition of a “white box” gallery wing in new construction. The palette of materials for the new gallery wing is limited to rough cut horizontal strips of limestone of varying widths asserting the mass of the new wing. Zinc clad roof lanterns will be set back from the parapet wall to allow the limestone to have prominence in the facade, whilst centralising the light penetrating into the gallery. The Father Matthew Hall will be re-rendered and re-roofed in slate, retaining externally the essence of its historical character, whilst internally it will be stripped back to its bare walls and roof structure. 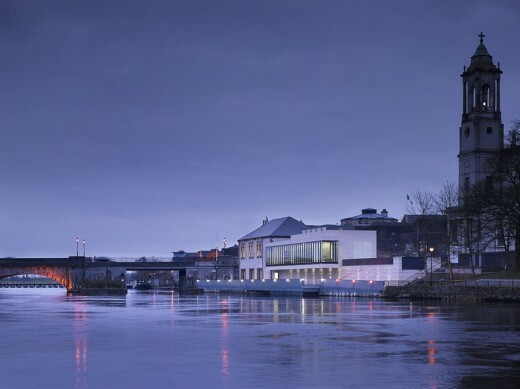 This is the third commission for Keith Williams Architects in Athlone, the first being the multi award-winning Athlone Civic Centre and Library completed in 2004 followed by the town’s Army Memorial in 2010. 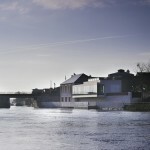 Keith Williams Architects have obtained Planning Consent (Part 8) for a new Art Gallery situated on the banks of the River Shannon in Athlone, Co. Westmeath, Ireland. 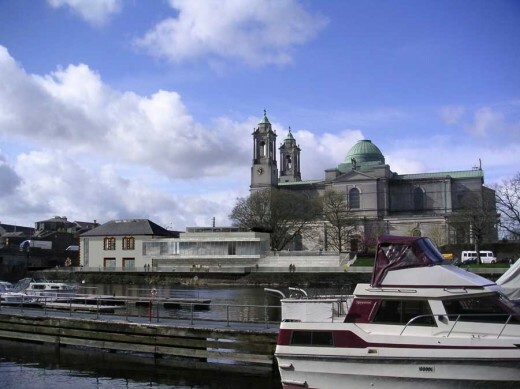 The project is situated on a spectacular site on the banks of the River Shannon, adjacent Athlone Bridge, and the neo-Baroque Church of St Peter and St Paul (1932-39). Williams’ designs involve the remodelling of an existing onetime temperance movement building, the Father Matthew Hall (1897) as a new artspace with the addition of a new “white box” Gallery wing and glazed river gallery. Originally built as a Temperance Hall in 1897 at the behest of Mr William Smith the Managing Director of the Athlone Woollen Mills, it was hoped it would entice his workers away from the public houses and into a life of sobriety! Later the hall became a venue for concerts and theatrical performances, and later still a cinema. In 1947 the building housed the Town Hall and County Library up until 1980 when extensive renovation works were carried out to convert the building to house the extended library. (The Town Hall re-located to new premises). In 2004 the library re-located to the new Civic Centre (also designed by Keith Williams) and the building has remained vacant since. Keith Williams is design director of Keith Williams Architects (KWA), a firm with a stream of accolades supporting its fast growing international reputation for the creation of dramatic, innovative architecture. The London based firm was winner of the prestigious BD Public Building Architect of the Year Award in 2006 & 2008, and has won more than 20 major design and construction awards for its built projects. The firm’s major projects include the multi-award winning Athlone Civic Centre, Co. Westmeath 2001-2004, the newly completed Wexford Opera House 2005 – 2008, and Clones Library & County HQ, Co. Monaghan 2004-2008 all in Ireland. Elsewhere, inert alia, the firm’s award winning Unicorn Theatre, London was completed 2005, The Long House, London in 2007, whilst at design stage the firm is working on the new Marlowe Theatre complex in Canterbury, in addition to the new district Museum in Chichester. Keith Williams is a specialist designer of cultural buildings including theatres, opera houses, museums and galleries, libraries, civic centres, and frequently faces the challenge of building in a tight urban or historic context. He is a member of the Royal Institute of Architects of Ireland, a Fellow of the Royal Society of Arts, a member of the Royal Institute of British Architects and has recently been appointed to the National Design Review Panel of CABE. The firm has won numerous competitions and its work, which has been published worldwide.